Quit pretending you don't need more guilt-free peanut butter recipes... You're only human! How can you say no to a wholesome breakfast that tastes like a Reese's Peanut Butter Cup? And why would you want to? 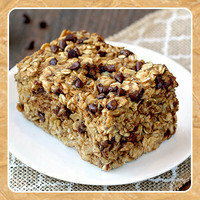 We're crazy about our oat bakes, and this decadent variation is one of our best. Want another peanut-butter-packed breakfast you can make in advance? PB Banana Overnight Oats, at your service. 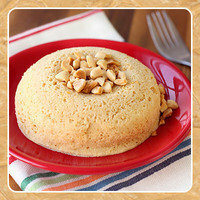 Rich 'n tasty peanut butter squares made with... beans?! That's right! Grab some good ol' garbanzos, and get to work. 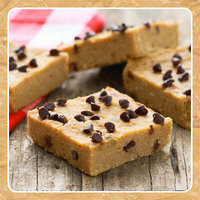 You won't taste the pureed beans at all; they simply give these blondies an amazing texture. YES, really. 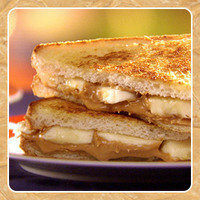 Peanut butter goodness at its finest! Rather than whisking together your wet and dry ingredients, we've got a better idea: break out your blender! No lumps in your batter, and no arm exhaustion. P.S. 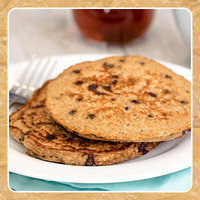 These fluffy flapjacks are nothing like your standard heavy pancakes. The ingredients are super wholesome, and the stats are shockingly impressive! The King of Rock & Roll didn't have the healthiest habits, but we can't dispute the appeal of a grilled peanut butter and banana sandwich. What we can do is make it over, so it isn't a hunka-hunka fatty calories. More of a PB&J fan? This grilled take on a classic is ready and waiting. Does your snack time need a little flair? No, don't munch on kitschy accessories... Try this recipe! 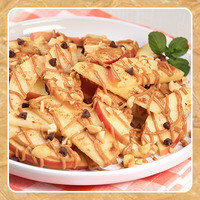 Standard apples & peanut butter are a lot more fun when they're served up as nachos. Season your apple slices with cinnamon, mix powdered peanut butter into a drizzleable sauce, and top it all off with chopped nuts and chocolate chips! Ready to make your friends and family think you're some sort of baking prodigy? 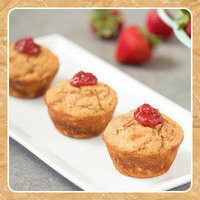 These muffins are injected with strawberry preserves, and it's super easy to pull off! The peanut butter base is mega nutritious, thanks to applesauce and Greek yogurt. Kids and adults will love these. 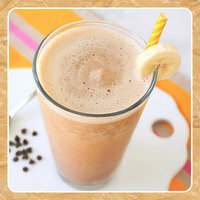 Here's a treat you won't find out in the wild (by which we mean restaurants and smoothie shops): a peanut butter & chocolate smoothie that's low in calories! It's also high in protein and desserty as heck. Embrace the powdered peanut butter, people! It’s January 26th, National Green Juice Day. How about a Clean & Green Shamrock Shake instead? Spread this info around like your favorite peanut butter! Click "Send to a Friend" or forward it right now.